 Mouse anti Human CD103 antibody, clone LF61 recognizes the human CD103 cell surface antigen, a glycoprotein expressed by approximately 1% of peripheral blood lymphocytes, activated T lymphocytes and by hairy cell leukemia cells. The antigen is also expressed by intraepithelial lymphocytes. It has recently been shown to be identical to the alpha E integrin. Flenghi, L. et al. (1990) LF61: a new monoclonal antibody directed against a trimeric molecule (150 kDa, 125 kDa, 105 kDa) associated with hairy cell leukaemia. Br J Haematol. 76 (4): 451-9. Falini, B. et al. (1990) Selection of a panel of monoclonal antibodies for monitoring residual disease in peripheral blood and bone marrow of interferon-treated hairy cell leukaemia patients. Br J Haematol. 76 (4): 460-8. Ling, K.L. et al. (2007) Modulation of CD103 expression on human colon carcinoma-specific CTL. Hadley, G.A. et al. (2001) CD103+ CTL accumulate within the graft epithelium during clinical renal allograft rejection.